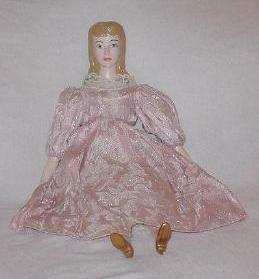 You can't have a web page about dolls, without the doll of all dolls Barbie. My first Barbie had the bubble cut like this. She was a brunette. When I saw these, Silken Flame Barbie's come out a few years ago, I had to have one. My husband bought her for me for Christmas. This was before I even really started buying dolls again. Like most American girls of the time (and I guess still) I had several Barbie's and their accessories. I had several Quick Curls, a Mod Hair Ken and Suntan Skipper, their 3-story house, camper, and swimming pool. And lots of lovely home made clothes, from my Mom and Grandma Hannawalt. 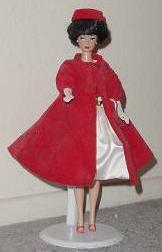 Anyway this is a new doll even though it's a reproduction of an older one. The doll to the right was made for my by my Grandma Hannawalt. She made this one for me and a dark haired doll with a different face, for my cousin one year for Christmas. She always made beautiful things for all of us. She was very talented in many crafts. Unfortunately my doll wasn't fired correctly and she breaks about every time you look at her. It's amazing that after all this time I still have all her parts. The first time she broke was on that Christmas morning when I received her. I was so sad, I cried and said I wished I had a normal doll. My Grandma Hannawalt went out and got me one. It had a vinyl head, feet and hands and a cloth body. She came in a pink gingham pajama and had a white blanket with the same pink gingham binding. I think still have the blanket around somewhere. Sadly this was one of the dolls lost over time and I have no idea who she was. I don't even remember what she looked like, or if she had hair or not, but I keep thinking she did have hair and it was blonde. The cute scarecrow below was also created by my Grandma Hannawalt. He won a prize for "Most Unusual Doll" at a doll show for children, which took place in a local park when I was growing up. I still have the little award here somewhere. My children love to play with him too.